After Batman had his back broken by Bane, he was healed through one of the lamest plot contrivances to hit comics in the '90s: his girlfriend's magic mutant powers, which then ceased to work so no one but Bruce would have access to this wonderful panacea. Yeah. The less said, the better. Anyway, that clusterf... er, that "Charlie Foxtrot" out of the way, Bruce needed to regain his skills. Just because he could stand up and walk, it didn't mean he could go right back to throwing crooks a beating. 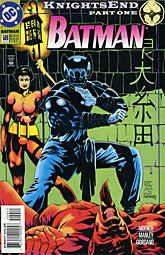 In order to get his mojo back, Bruce turned to the person he considered the greatest martial artist in the world: Lady Shiva. Though she found Bruce's refusal to kill a sign of deep weakness, Shiva agreed to train him. She gave him a uniform to wear, and a bat-like tengu mask to top it off. 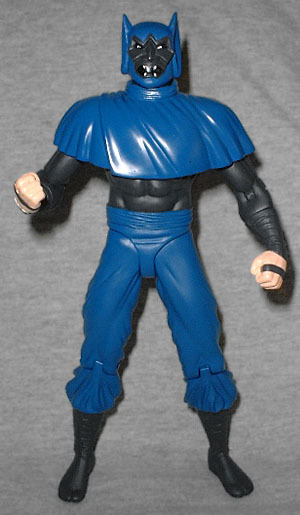 DC Direct has just released a series of figures based on "Knightfall," the megacrossover in which all this took place, and Mask of Tengu allows them to sneak two Batmen into one line. You know they have to love that. The figure is sculpted nicely. Each of the "Knightfall" figures was handled by a different artist, and Mask of Tengu is the work of Barsom. The costume is traditional ninja garb - tabi boots, baggy pants and wraps around the shins and forearms. He's wearing some kind of shawl over his shoulders, and of course the tengu mask. The design is plain, but handled well, and the paint really does it justice. The majority of the costume is a dark blue, which suits the character. Beneath that he's got a black body suit, and while it may not be obvious at first glance, the wraps on his arms and legs are a different color than the rest of the body. The edge where the pink of his hand meets the blue-black of the wrist is slightly uneven, but it's a whole lot better than a lot of recent DCD figures have been. The mask has some relly crisp details, particularly the tiny white teeth and eyes. Articulation is a bit above average for a DCD figure, but we'll get the important question first: no, he doesn't have a waist. What he does have is a balljointed head, balljointed shoulders, pins at the elbows and knees and, the bonus for this figure, peg joints in the forearms and shins. Yes, Mask of Tengu moves where the wraps meet the clothes. Surprisingly, the shawl on his shoulders doesn't really restrict the shoulders much at all - it's soft enough that the arms just move it out of the way. Some of the joints were pretty hard to move at first - one of the knees, in fact, was nearly painted shut, and the forearm pegs didn't want to turn. Be careful if you get this figure. The baggy pants are sculpted with enough space behind the knees that they won't block the movement. Mask of Tengu Batman only has one accessory, a 3½" diameter display stand. 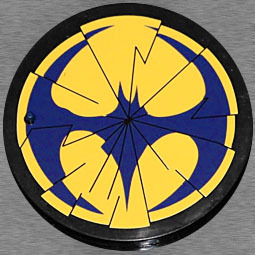 The stand is painted with the Knightfall logo (the Bat-signal, shattered) and has a foot peg on the left side. It's nice, but that's it? Gotta say, DCD dropped the ball big time with this one. Can anyone name one good reason why the Tengu mask can't be removed to reveal a Bruce Wayne face underneath? Bad planning, and a huge missed opportunity. This costume actually played an important part in the plot of the story: it's more than fancy pajamas! During one of Shiva's training sessions, Bruce was attacked by a group of strangers looking for revenge. In an effort to complete Bruce's training, Shiva had donned the Tengu costume and killed a prominent sensei in front of his best students. She thought that in facing an entire dojo's worth of furious martial artists, Bruce would be forced to kill in order to save his own life. Knowing that if he failed to take a life, Shiva would just do it again, he faked the Leopard Blow she had taught him, leading her to believe she'd finally corrupted him. Mask of Tengu Batman is the rare figure from this set (in that you can't order him by himself), which probably suits his status, but it's a nice figure. He'll add a much-needed bit of variety to a Batman collection, and he's generic enough to be a ninja thug in any display. Not giving us a removable mask is a pretty major oversight, but the paint and sculpt are nice, as are the joints. Once you get them moving.